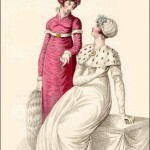 Lady’s Monthly Museum, March 1808. This magazine did not always indicate what type of dress is depicted in a print. Sometimes the title of the print will indicate evening and/or walking dress, and sometimes the magazine text indicates full or walking dress. In this case, there is no identification of the type of dress on the print or in the text. However, Fig. 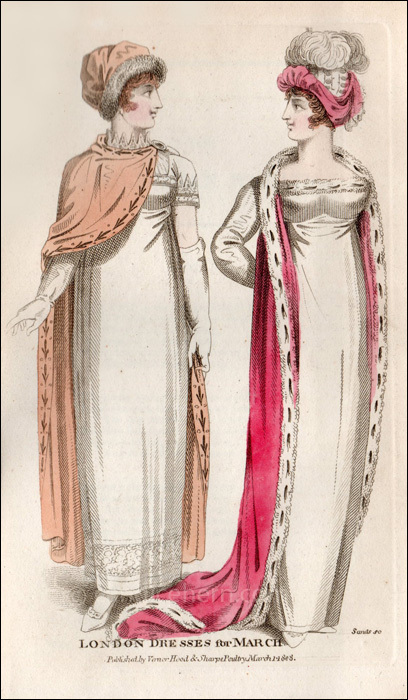 2, on the right, is clearly an evening ensemble — the long ermine trimmed robe would not have been worn during the day. However, Fig. 1, on the left, is less clear. 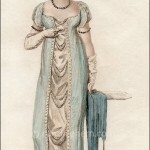 The short sleeves and long gloves, a combination seldom seen in day wear in English prints, suggest an evening ensemble. Perhaps Fig. 1 represents Half Dress and Fig. 2 Full Dress? “Fig. 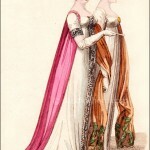 1.–Plain muslin dress, embroidered round the bottom, sleeves, and tucker to correspond; a fashionable silk mantle; head-dress the same colour; white kid gloves.